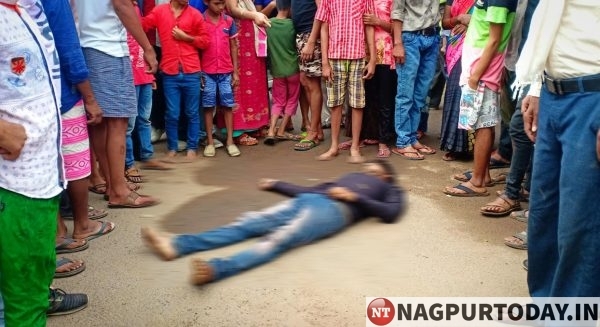 Gondia: Tension ran high in a locality of Gondia when a man shod dead his friend on Wednesday morning over old dispute. After killing his friend, the accused went absconding and is being searched by cops. Both, the accused and the deceased were in illegal liquor trade and business rivalry led to murder. The accused named Akash and deceased Rahul Aniruddha Borkar were good friends. As they were in illegal liquor trade, skirmishes erupted between them on one occasion or another. The trouble started on April 13 when the deceased Rahul, angry over some issue, stormed the illegal hooch den of the accused Akash and ransacked it. Furious over the incident, Akash and his accomplices, armed with swords and other weapons, searched Rahul the whole night to settle the score. However, due to intervention by some persons, calm prevailed between the two ‘friends’ albeit for a while. The accused Akash was simmering with anger over the April 13 incident and he was looking for an opportunity to settle score with Rahul. On Wednesday, April 17, around 8.30 in the morning, the accused Akash spotted Rahul Borkar (34), a resident of Laxmi Nagar, Gautam Buddha Ward, walking near Bhimnagar Post. He accosted Rahul and shot him in the chest. Akash probably used a country made pistol. The bullet in the chest proved fatal and Rahul died on the spot in the middle of the road. According to Rakesh Borkar, younger brother of deceased, Rahul left home around 8 am. A short while after, a woman came running to his house and informed that Rahul was lying on the road near Bhimnagar Ground. When parents of Rahul reached the spot they saw him lying motionless and mark of bullet on his chest. On being informed, local cops rushed to the spot and started investigation. Teams of police have been formed and sent to various places in search of the accused Akash.